Screen porches give you the pleasures of the outdoors without truly being outdoors. We cannot ignore the mosquito problems facing Texas this season. This year has been the worst on record for West Nile virus cases on record for Texas. Mosquitoes have frightened us off our patios and decks and made us retreat indoors for fear of contracting West Nile Virus. I am certain many outdoor entertaining endeavors have been put on hold, and many barbecues cut short because of the mosquito. Archadeck of Austin has the perfect cure for your outdoor living mosquito induced blues; a screened porch addition to enhance your home and other outdoor living structures. 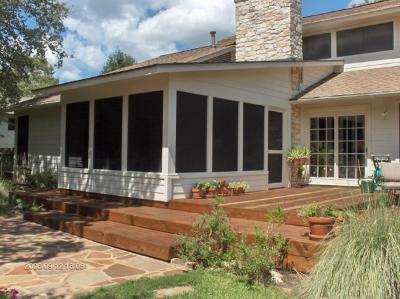 This combination gives these Austin homeowners the best of both worlds, a deck with a screened porch to escape the mosquitoes and keep the outdoor living rolling. According to a recent article by The Huffington Post Texas has recorded at least 510 cases of neuroinvasive West Nile, considered the most serious form of the illness because it affects the nervous system, according to the Texas Department of State Health Services. Having a screened porch to escape from the dangers of mosquitoes will not only enable you to continue to enjoy Texas outdoor living, but it will aid in reducing your risk of coming into contact with a mosquito that could be carrying West Nile Virus. Screened porches give you the freedom and beauty of outdoor living without having to deal with the threat of bothersome insects, including mosquitoes. I guess you could call the screen porch another method of mosquito prevention because the presence of screen puts a barrier between you and the hungry bugs. 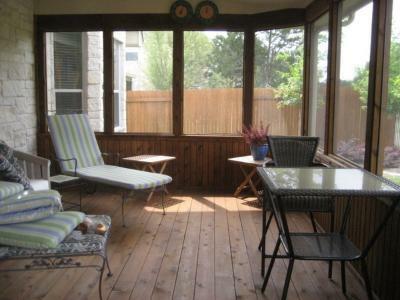 Screen porches also provide protection from inclement weather such as wind, and rain. 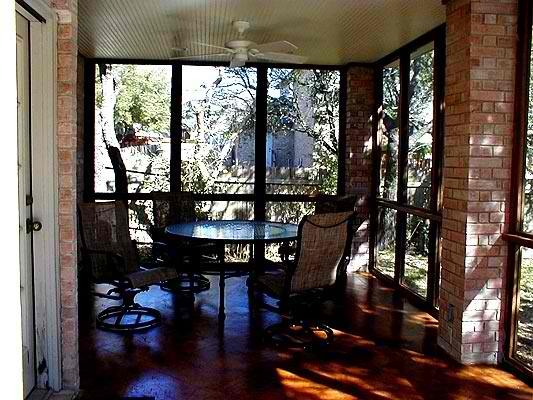 This cozy screened porch in the Austin, TX area serves as a haven from insects, rain and wind. A screen porch can be used in conjunction with a deck or patio as a focal point of an outdoor living structure combination, or can be added to your home to serve as an outdoor living room. Our screen porch designs offer plenty of functionality, from the inclusion of custom outdoor fireplaces, ceiling fans and other creature comforts. We can even construct a custom spot to mount an outdoor TV, just in time for football season. When it comes to the many benefits and inclusions a screened porch can add to your lifestyle, the world is your oyster. To see more examples of bug free outdoor living at its best visit our screened porch photo gallery located on our website. This entry was posted on September 26, 2012 by austinporchandpatio. It was filed under Protection from insects, Protection from the elements, Screened porches and was tagged with Archadeck of Austin, Archadeck of Austin design, Austin custom screen porches, austin outdoor fireplace, Austin outdoor room, Austin outdoor structures made to keep bugs out, Austin outdoor structures that keep inclement weather out, Austin screened porches, Protection from insects and rain with screened porches, The Huffington Post.